Creating the perfect Mother’s Day brunch is easy, when you follow Ciara McDonnell’s simple rules. Mother’s Day is a tricky one, to be perfectly honest. Lots of the team here at I Love Cooking are Mams, and we all agree that while it is absolutely gorgeous for our children to pile all their love onto one plate, the wreckage of our kitchens often becomes too much to bear. I particularly, am a total control freak when it comes to my kitchen. I can barely stand my partner making toast, or my sons cracking the eggs for an omelette before I swish around them, administering top tips as though I was hosting a cooking class. For this reason, brunch is the most ideal way to treat me on Mother’s day. I can occupy myself by obtaining more sleep, while my kids perform culinary miracles in my absence. If you are planning on spoiling your Mam this mother’s day, then choose brunch as a way to start off the day. Do not stop there, by any means. 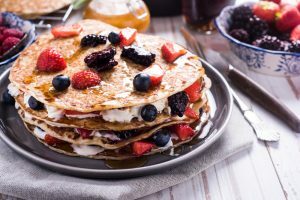 If a mother feels she is being pawned off with a mere brunch, she will hold that grudge close to her heart for the rest of the year, so make sure that you have lots planned throughout the day to make your mother know how much she means to you. There is absolutely no point in giving your mother something she won’t like on the day she is to be celebrated. You might be in an avocado toast obsession at the moment, but it doesn’t mean that she will appreciate it. Make note of what she likes and incorporate this into your menu. 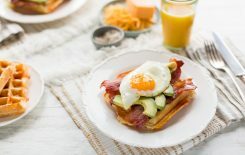 The old reliables like eggs benedict and scrambled eggs with smoked salmon remain unbeatable in my opinion, but if you need more inspiration, check out our collection of brunch recipes here. If you are catering in your house, set the table the night before. Make sure that linens are clean and ironed, you have the correct amount of silverware and plates and that all glasses are sparkling and chip-free. If you are cooking at your mother’s, bring a box of everything you might need, so that you won’t be annoying her while she is meant to be relaxing. Also, remember that while some people might enjoy a brunch mimosa, lots of people will just want tea or coffee, so nice cups are a must! Make up the pancake batter, the cocktail mix and the fruit salad the night before. Anything that can be made in advance, should. This will facilitate the inevitable last-minute run to the shops for a jar of chutney. If you want to be part of the crowd, you won’t want to be flipping pancakes while everyone is sitting down. Make a french toast instead, and sit it in the oven at a low temperature. Equally, baked streaky bacon holds better than grilled back rashers, so bake them along with sausages, and keep warm with your french toast. If you want to avoid a batter situation altogether, make scones ahead of time, freeze and defrost on the morning of the brunch, warming for a minute or two in the oven and serve with cream and high quality jam. A little granola pot can be a gorgeous way to start the meal – have a miniature jar sitting at each person’s place setting before brunch begins to set the mood. 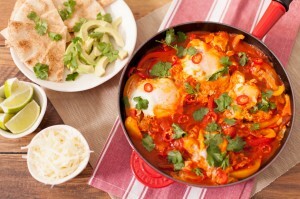 The undeniable star of brunch, eggs cannot be forgotten. I love to serve poached eggs, cooked medium runny. I cook them in advance, shocking them in a bowl of iced water once cooked. I then keep them in a bowl of cold water, ready to reheat in gently rolling salted water for 30 seconds, and ta-da! Lots of poached eggs, all ready at the same time. Huevos Rancheros are another huge favourite of mine, served to a crowd with lots of guacamole and just-warm tortillas can be heavenly. Just because this is a breakfast party, does not mean you should scrimp on dessert. I am a huge fan of homemade lemon curd, served with shortbread biscuits and whipped cream sweetened with vanilla extract and icing sugar. If you want to push the boat out, make some homemade danish pastries or blueberry muffins. A loaf of homemade bread, of course, remains the ultimate brunch indulgence – why not whip up a loaf of rye and poppyseed bread to show your mother how much you knead her. Sorry, I couldn’t resist.